The latest additional tothe Realm is the Shieldbearer, a veteran soldier wieldinga flail in one hand and a massive shield in the other. Shieldbearers are nostrangers to conflict. Those that are selected to become Shieldbearers are allveterans of war. Having survived countless battles, they understand the ways ofthe battlefield more than anyone. A Shieldbearer trains rigorously in order towield their massive shields in combat without hindrance. Their shields can beused to deflect the most devastatting attacks, as well as to crush anyonefoolish enough to get close. Shieldbearers are often deployed to protect highvalue targets or defend important positions. A Shieldbearer can greatly enhancethe capabilities of his allies, enabling them to hold out against overwhelmingodds until reinforcements arrive. When enemies see Shieldbearers in aformation, they know they are in for a long and tough battle. 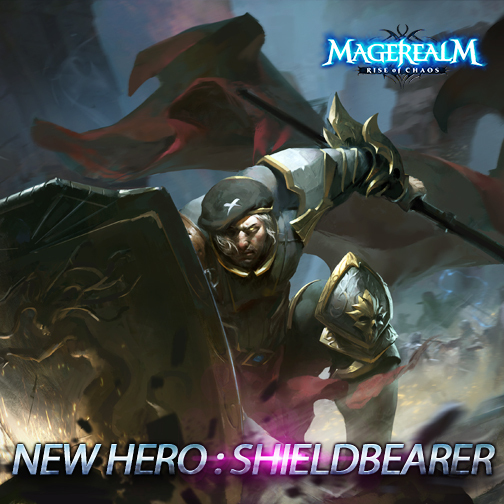 Shieldbearer is a defensivehero that brings to your team will significantly increase your durability. Bothhis Guard Stance and Shield Wall will provide great protection for your entireteam. Guard Stance is espesically valuable against enemies with a lot ofcontrol effects, while also providing an offensive boost with increase hitrate. Shield Wall gives a near permenant 30% damage reduction to your team, andcan also silence attackers to reduce their output. Second Wind, his 3rdpassive, can periodically heals him or give him a significant defensive buff. Shield Slam and Shield Sweep are AOE attacks withthat can control the battle with their stun and knockback effects. His ShieldSweep will keep melee enemies at bay by knocking them away and slowing theirmovements so they can’t re-engage immediately.